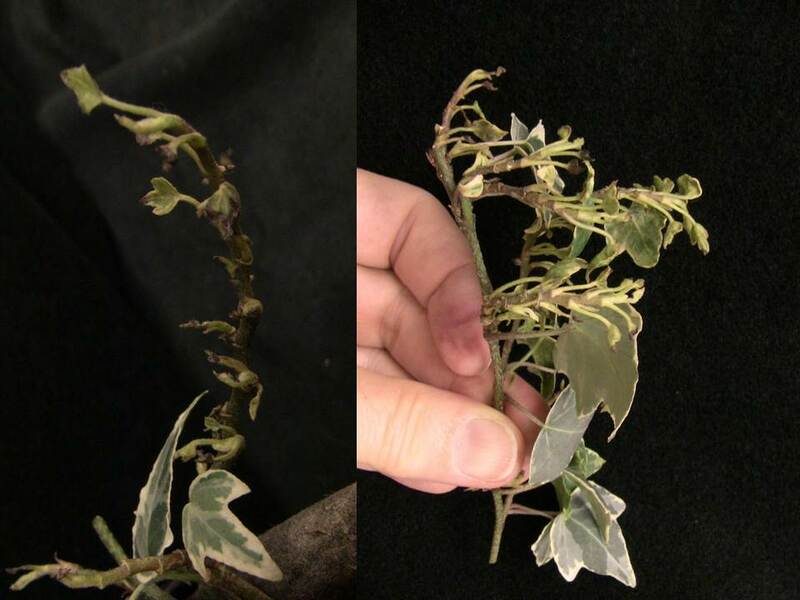 Broad mite, Polyphagotarsonemus latus (Banks), has reared its ugly little head on a sample of English ivy which was examined by Nancy Taylor at the C. Wayne Ellett Plant and Pest Diagnostic Clinic at Ohio State University. The grower explained that the plants were not growing and that the youngest leaves had been very stunted for a number of weeks. Nutritional testing had not revealed any problems; bromine being added to the irrigation water was suspected as a toxin but the grower did want the plants evaluated for evidence of a disease or insect problem. The symptoms did, indeed, mimic a chemical injury but a very close look at the youngest leaves which were still emerging and expanding from the buds showed numerous eggs, nymphs and adult broad mites. These pests were responsible for the foliar distortion. Broad mites are tiny and very high magnification is required in order to see them, unlike other types of mites such as the more familiar two-spotted spider mite which shows up in greenhouses occasionally. 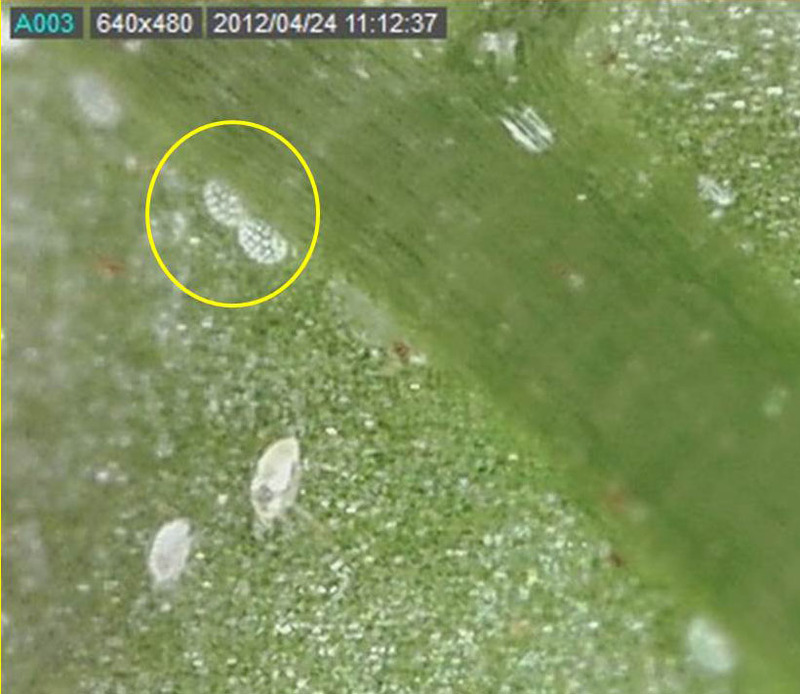 Broad mite eggs (L) and the mite itself (R) among leaf hairs. Broad mite eggs on pepper. Adults are below circle. 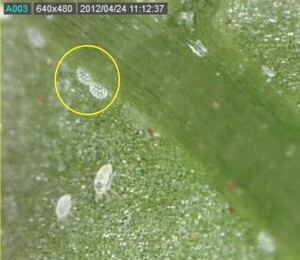 The eggs are characteristic of the broad mite. 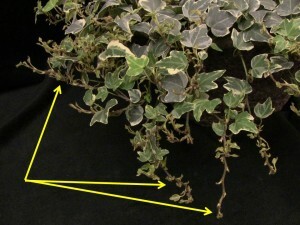 The grower reports that effective management practices for broad mite are contributing to the English ivy’s good recovery. If you suspect a broad mite problem but do not have sufficient magnification to see them, samples can be submitted to the Clinic. See the Clinic’s web site at http://ppdc.osu.edu. Description: adults are very small, light brown to light yellow in color, and they are difficult to see. Adult females can lay up to 76 eggs. Males live for 5-9 days, females 8-13 days. Eggs are very characteristic, they are translucent with little white dots on top (wax-like domes). Plants affected: English ivy, begonia, cyclamen, new guinea impatiens, African violet, ageratum, azalea, dahlia, gerbera, gloxinia, jasmine, lantana marigold, verbena, zinnia. Other plants include: citrus, tomato and pepper. 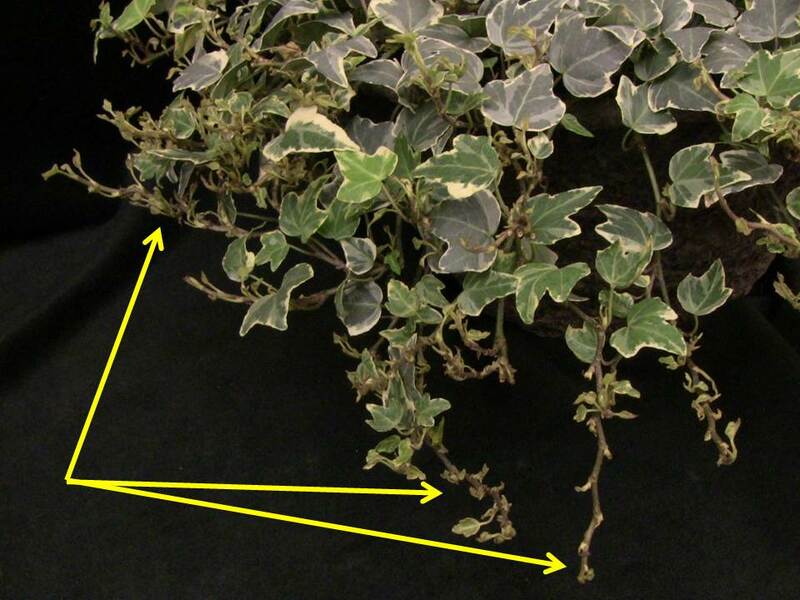 One way to manage broad mites is through the use of miticides. The list below includes some products that have been labeled for use against broad mites on ornamentals. Note: Remember to read and follow the recommendations of all product labels before using any product. The listing of a product does not imply endorsement by the authors. Biological control: the predatory mite Neoseiulus californicus has been reported as a good predator of this mite. Posted by Beth Scheckelhoff at 11:08am Posted in Insect Management and tagged broad mite, diagnostics, mites, pest management, plant pest. Bookmark the permalink. ← Preventing ethylene damage in the production greenhouse: Proper heater installation and maintenance and electric carts! !